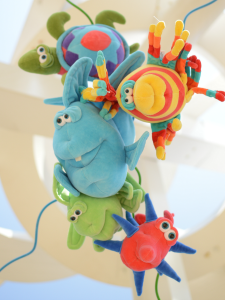 For more than 30 years, Funny Friends has been a premier plush company recognized worldwide for championing decorative but huggable designs for infants, toddlers and preschoolers. Thirty years from its launch, Funny Friends has established itself as a frontrunner in the artistic plush market. Synonymous with a fun and contemporary lifestyle. From Funny Friends "Sea Creature Collection"
Funny Friends’ stuffed toys and plush art represents artist Jennifer Mazur-Becker’s playful interpretation of the world’s best-loved creatures. Designed both for play and display, all pieces are designed to delight infants, toddlers, preschoolers and mothers alike. Jennifer’s aim is to help turn the child’s room into a happy space where magic happens every day. In 1982, Jennifer created a Limited Edition Soft Sculpture Art Collection for Sherwood Galleries, in California. Her collection was made entirely by her hand using airbrushed textiles or real fur pieces. Jennifer launched Funny Friends to make her popular soft sculptures more broadly available as stuffed toys and decorative art for children. Over the years, Jennifer has designed over 300 plush creatures. Today, the Funny Friends themed collections includes 140 unique artist-designed soft sculptured stuffed toys and kid-friendly plush art. When she isn’t creating plush sculptures, Jennifer designs furniture and objets d'art. She also provides interior design consulting services, specializing in turning residential and commercial spaces into unique and dynamic environments for children.